No Tape, No Glue, No Staples - GET SLICKY! 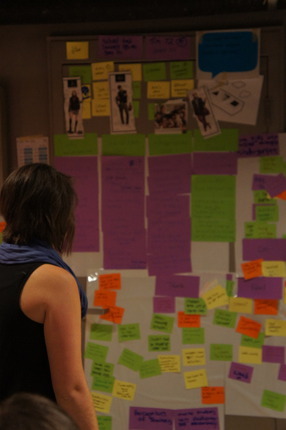 The next generation of sticky notes are now called SLICKYNOTES & SLICKYBOARDS! This electric-static charge sheets last for weeks. Stick, Re-Stick and Slide the sheets on any indoor smooth surface. Use both sides and erasable on the white side with a dry is marker. Stick to walls, windows, doors, wood desk and more. You save more, have more with these double sided sheets. One pad has never came this far! A great way to get your feet wet! -- EcoStatic Inc. Beginner Kit comes with 10 sheets of Slickyboard, 1 pad of Medium Green and 1 pad of Large Green Slickynotes. The 4 x 27in packing tube doubles as a travel container for your Slickynotes and Slickboard products. Stick to any smooth, dry surface like drywalls, windows, wallpaper, wood desk, doors and more. Their stable electrostatic charge lasts for weeks. Stick, re-stick and slide them around. Adhesive free and 100% recyclable, use them indoors for ideation, brainstorming, presentation or simply leaving a lovely note. Turn any surface into a creative space. Set your ideas free! Multi colored Slickynotes Large 3 Pack, save BIG, Save money, have more! Slickynotes Large are double sided and reusable on one side. 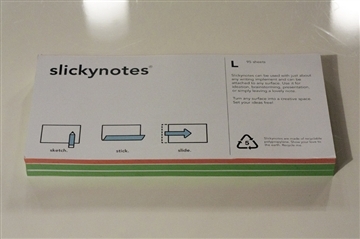 Our Slickynote gives you the option to write notes with more space, have a coaching event, corporate training, Agile, Scrum, Lean, Kanban session or just want to release your creativity! 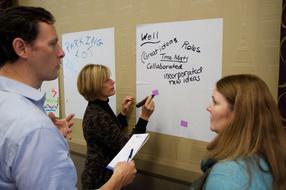 Slickynotes can be used with any writing implement on the colored side, FLIP the sheet over and use a dry erase marker and erase it. You double your pad while saving money and have more! One pad has never came this far! You can stick to any smooth, dry surface like drywalls, windows, wallpaper, wood desk, doors and more. Their stable electrostatic charge lasts for weeks. Stick, re-stick and slide them around. Adhesive free and 100% recyclable, use them indoors for ideation, brainstorming, presentation or simply leaving a lovely note. 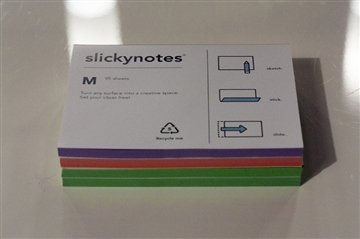 Slickynotes 3 pack colors include 2 Green, 1 Orange. Each pad of Large Slickynotes includes 100, 200 x 100mm (7.87 x 3.94in) sheets. Turn any surface into a creative space. Set your ideas free! Multi colored Slickynotes Medium 4 Pack, save BIG, Save money, have more! 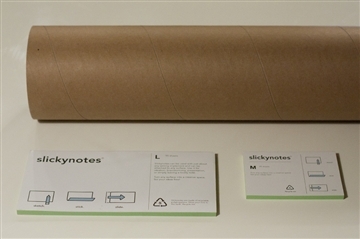 Slickynotes Medium are double sided, reusable on one side and 21% bigger than your regular 3x3 sticky notes. Our Slickynote gives you the option to write notes with more space, have a coaching event, corporate training, Agile, Scrum, Lean, Kanban session or just want to release your creativity! Slickynotes can be used with any writing implement on the colored side, FLIP the sheet over and use a dry erase marker and erase it. You double your pad while saving money and have more! One pad has never came this far! You can stick to any smooth, dry surface like drywalls, windows, wallpaper, wood desk, doors and more. Their stable electrostatic charge lasts for weeks. Stick, re-stick and slide them around. Adhesive free and 100% recyclable, use them indoors for ideation, brainstorming, presentation or simply leaving a lovely note. Slickynotes 4 pack colors include 2 Green, 1 Orange and 1 Purple. Each pad of Medium Slickynotes include 100 sheets, 100 x 74mm (3.94 x 2.91in). 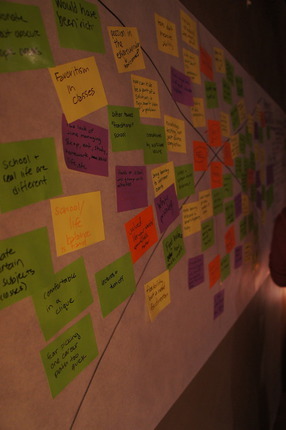 Turn any surface into a creative space. Set your ideas free!